With their White Widow Haze, Zambeza releases a remarkable sativa-dominant strain where you can look forward to very respectable yields of 500-550g/m² in a flowering period of 65 days. Indoors, the plant will normally reach a height of 80-110cm which makes her “just right” to still be manageable without growing out of control. If you grow her outdoors in sunny conditions, White Widow Haze can get much taller. With her being a typical sativa, get ready to see her stretching a good bit in the sun when she goes into flowering. This is where she can reach heights of 230-300cm with yields of up to 700g per plant. White Widow Haze has been created to be all about potency and to deliver an outright spectacular sativa high. When you smoke her, get ready for a superb cerebral rush that will boost creativity and productivity, she’ll give an uplifting and energizing boost that makes White Widow Haze a perfect daytime smoke to relieve stress and lift your mood! No surprise there, seeing that lab tests have shown White Widow Haze having as much as 20% of THC. While her high is already spectacular, her great taste doesn’t leave much desired either. She blends a variety of tropical fruit aromas into an amazingly sweet smoke experience that will make you crave more with every single hit. White Widow Haze by Zambeza is pretty much a classic sativa no matter how you look at her and there isn’t a lot left to her indica side – except when it comes to her pleasantly short flowering time for a Haze. With their White Widow Haze, Zambeza managed to make a spectacular strain even better. No question that White Widow Haze will delight all those who love powerful sativas, she's a top choice that's sure worth growing! 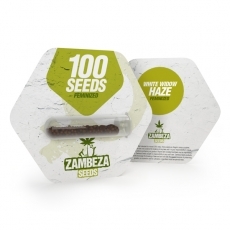 Growers who require more seeds can get White Widow Haze bulk seeds in packs of 100 seeds.